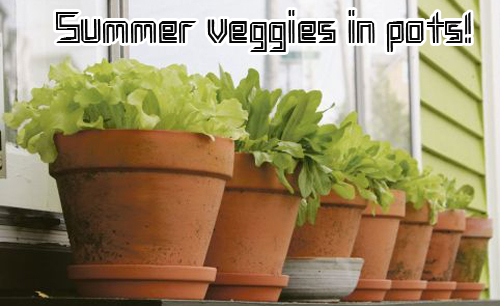 If you have a sunny space on your patio or deck, you have enough room to grow summer veggies. Containers: Large sizes ranging from 18" to 24" provide plenty of room for roots and don't dry out as quickly as small containers. That translates into healthier plants that yield more produce. Terracotta, poly resin, glaze or high fired pottery all work well. You must have good drainage so think about a saucer with your container for indoor use or pot feet for your container outside. The saucer should be large enough to hold any run off that may occur while watering. The rule of thumb is the saucer should sit on the top opening of the pot and look like a lid. Because many pots are tapered in style, you can go with a smaller saucer if you prefer that look. However, don't go so small that the saucer defeats it's purpose. 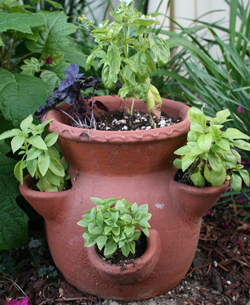 Our pot feet can be used to support a container or saucer off the decks surface to make cleaning easier and keeps water from pooling under the pot, causing deck stains. Premium potting mix is preferred. Press soil firmly around each veggie plant and when finished should be 1" below the containers rim. Water as often as needed to keep soil moist. 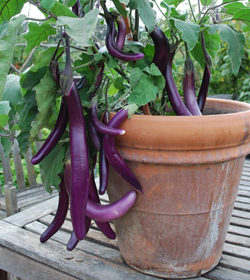 You can plant 10 to 20 beans, 3 egg plants or peppers or two cucumbers in a single large container. Fill the edges with edible companions like basil.